Los Angeles County's original boundaries upon California becoming a state included present-day Orange County and portions of present-day Ventura and Riverside Counties. Map showing Los Angeles County, 1850 (dotted box added to image). From California County Boundaries by Owen C. Coy & California Historical Survey Commission, 1923. Los Angeles County's boundaries expanded considerably to include present-day counties of Orange and San Bernardino and portions of present-day Ventura, Riverside and Kern Counties. Map showing Los Angeles County, 1852 (dotted box added to image). From California County Boundaries by Owen C. Coy & California Historical Survey Commission, 1923. Los Angeles County's boundaries contracted after the eastern portion was formed into the new San Bernardino County in 1853. Map showing Los Angeles County, 1860 (dotted box added to image). From California County Boundaries by Owen C. Coy & California Historical Survey Commission, 1923. Los Angeles County's boundaries contracted further after a northern portion became part of the new Kern County in 1866. Map showing Los Angeles County, 1867. Map by Leander Ransom, A.J. Doolittle, George H. Baker, Warren Holt, courtesy Library of Congress. After a portion of Los Angeles County became part of the new Ventura County in 1873, Los Angeles consisted of its present day territory and all of present day Orange County. Map of Los Angeles County, 1888. Map by V.J. Rowan & Schmidt Label & Litho. Co., courtesy Library of Congress. After the formation of Orange County in 1889 from its southern portion, Los Angeles County has mostly maintained its current boundaries since then. Map of Los Angeles County, 1898. Map by E.T. Wright, C.N. Perry & Los Angeles Lithographic Co., courtesy of Library of Congress. Map of Los Angeles County, today. County of Los Angeles map from Los Angeles Almanac Maps. 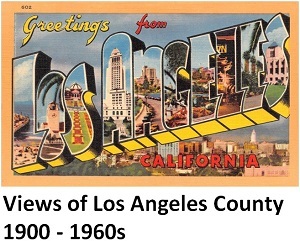 Only very minor adjustments have occured to Los Angeles County boundaries since 1889. The most recent was in 2001 when a small portion of northwestern Los Angeles County was transferred over to Kern County in order that residents might be better served by closer county services in Kern County. In 2005, residents of the neighboring unincorporated community of Gorman also sought approval to transfer their community to Kern County. Their efforts were not successful. Before and after maps showing a portion of Los Angeles County transferred to Kern County. Los Angeles Almanac Maps.